Jennifer Lawrence as Katniss and Liam Hemsworth as Gale. Dying for a peek at the upcoming Hunger Games movie? This Sunday's MTV Video Music Awards will feature the first publicly available footage from the film, according to NextMovie.com. The VMAs air at 9 p.m. EST, and Katniss herself (Jennifer Lawrence) will introduce the clip. I, for one, am pleased to have this excuse to watch the VMA. I mean, it's not like I'm curious about what Katy Perry will wear or what Kanye West will say. That's not interesting to me at all. Ahem. 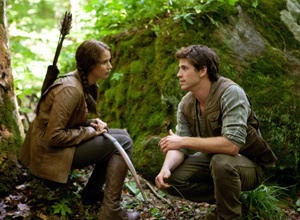 The Hunger Games, based on the book by Suzanne Collins, hits theaters March 23, 2012. Here's hoping the footage is compelling enough to keep our appetites at bay until then. Will you be tuning in?